6th IEIA Open Seminar - "Collaborating to Achieve Excellence"
The 6th edition of IEIA Open Seminar organized by the Indian Exhibition Industry Association (IEIA) was held on 6 and 7 May 2016 at the Bangalore International Exhibition Centre in Bangalore. The seminar which had "Collaborating to Achieve Excellence" as its theme was spread over 2 days and had an array of speakers from India and overseas. Around 200 delegates turned up for the seminar. Mr. Indra Mohan Gupta, Chairman, Winmark Services was conferred the IEIA Lifetime Achievement Award for his contributions to the Indian exhibition industry. The seminar featured interesting presentations and panel discussions. Digitalisation is not only changing marketing, it is also impacting exhibition venues. The Operations and Services Focus Meeting organized by UFI from 21-22 April 2016 at Suntec Singapore Convention Centre was an opportunity for the Bangalore International Exhibition Centre to explore the latest technologies and examine how event professionals make the most of new developments. The world of work is changing rapidly. Although the model of working 9-5 for a single employer still exists, millions of people all over the world are finding new ways to generate income. IMEX 2016 offered tracks on personal development and wellbeing. The Indian Machine Tool Manufacturers' Association (IMTMA) organized an interactive faculty meet on the opportunities in manufacturing industry and IMTMA's training initiatives at the Bangalore International Exhibition Centre in Bangalore on 10 May 2016. The objective of the faculty meet was to highlight the role of IMTMA in industry-institution interaction and apprise participants about IMTMA’s industry specific training programmes. The meeting held at the Bangalore International Exhibition Centre in Bengaluru was attended by around 50 delegates. Around 280 exhibitors congregated at the Diemould India 2016 exhibition held at the Bangalore International Exhibition Centre (BIEC) by Tool & Gauge Manufacturers’ Association from 6 to 9 April 2016. BIEC was hosting the 10th Diemould exhibition at its premises for the first time. The exhibition showcased wide range of new and emerging technologies such as such as 3D additive manufacturing technology solutions, precision machining, aerospace, injection moulding machine, solutions, etc. Herbalife associates from all over India gathered at the Bangalore International Exhibition Centre from 13 to 15 May 2016 to celebrate the Herbalife event. The event provided the associates an opportunity to propel their business to greater heights. Herbalife's top leaders provided training for them to build a sustainable business. 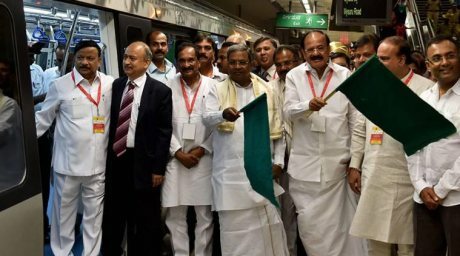 The Bangalore Metro Rail Corporation is nearing completion of first phase with the connection of the East-West corridor. The North-South corridor to city centre stretch between Mantri Square and Majestic will be functional soon. This will enable commuters and visitors to BIEC to reach South Bangalore and other parts of the city faster. The second phase will begin soon in which metro will be connected to BIEC. This will enable easy commuting to BIEC. 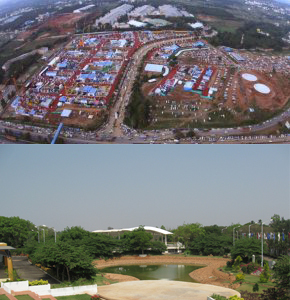 Bangalore International Exhibition Centre (BIEC) is expanding. It has acquired additional land for construction of a new hall of about 17,500 sq.mts. by 2017 and another hall of same size later.